In the industry, the cleanliness of workpieces, components and machine elements is a prerequisite for functioning processes. Industrial parts cleaning is a cost-relevant quality factor in industries such as the automotive industry and its suppliers. High-pressure water cleaning systems degrease, de-oil or remove residues environmentally friendly, quickly and thoroughly. URACA pumps and high pressure tools with a pressure of up to 3,000 bar are the ideal solution for industrial parts cleaning. You want to clean your workpieces as efficiently as possible? URACA finds the ideal solution. Industrial parts cleaning is used in all branches of industry. The metal industry removes rust, deburs or strips components for direct further processing. In the automotive industry and its suppliers, the preparation of engines, transmission components or body parts takes place before the assembly process. Further areas of application are the cleaning of molds, small parts or control panels. High-pressure technology requires high working pressures of up to 3,000 bar for optimum cleaning effect. Pressure, flow rate and distance and angle of the water jet must be easily and finely adjustable. Controllable pump units and various nozzle systems are required. Since continuous cleaning of the products to be processed takes place in many industrial processes, the technology must be designed for continuous operation under extreme conditions. With high-pressure technology and water, all materials can be cleaned in a solid state of aggregation, such as glass, stone, metal, plastic, wood, ceramics, food and more. In principle, the methodology is always the same for high-pressure technology. Water radiates at high pressure on the workpiece to be cleaned. The parameters pressure, volume flow, distance and angle are variable and can be flexibly adapted to the different materials and residues to be removed. 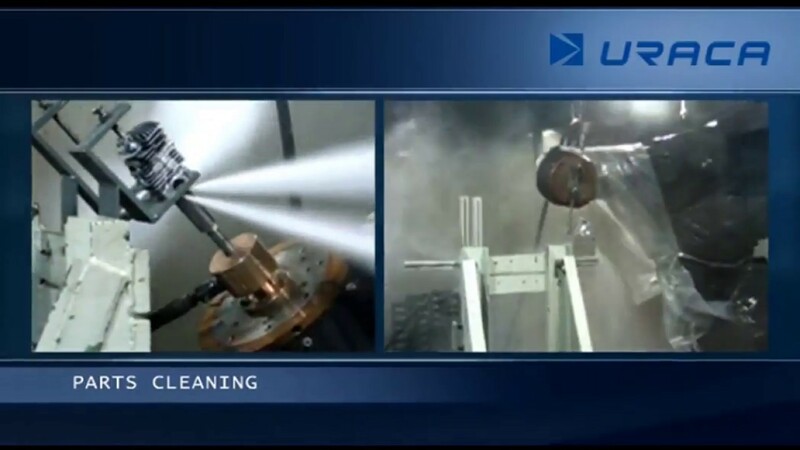 For industrial cleaning of parts of different types, URACA offers a wide range of individual applications for various applications of adaptable products such as pump sets, rotary joints and nozzles. For industrial parts cleaning with high pressure technology, it is crucial that the water pressure, volume flow and direction of the water jet can be individually adapted to the workpieces to be cleaned and the residues to be removed. URACA has a high level of expertise in this area and offers a wide range of products for you. Contact the cleaning experts at URACA now. We are happy to assist you and find suitable solutions for your cleaning case.